PHILADELPHIA -- An alleged gunman is in police custody following a lockdown of the Community College of Philadelphia Tuesday morning. 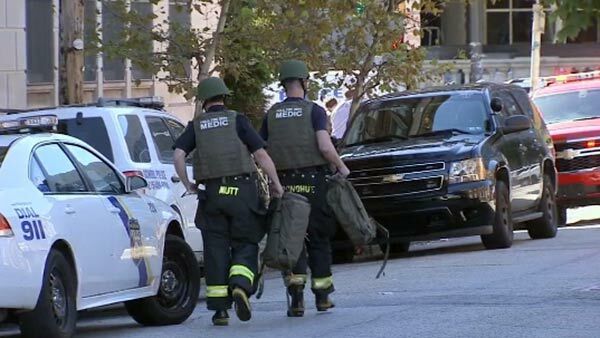 The 17-year-old suspect was taken into custody inside a classroom at the School of Business and Industry at 18th and Collowhill streets. Police have not released his identity at this time. It was around 9:30 a.m. when the suspect and another male allegedly had a dispute at a courtyard outside the Bonnell Building on the campus in the city's Spring Garden section. Authorities tell Action News that a male reported that he was threatened by the suspect with a handgun. The gunman then allegedly ran into the nearby Winnet Student Life Building. No one was injured int he incident. Philadelphia Police Commissioner Charles Ramsey said the two men have a history. He said they know each other, there was an argument, and one of them allegedly produced a gun. Masterman High School, located just across the street from the college, was also placed on lockdown as a precaution. This comes just one day after an online post threatened an attack at a college or university in the Philadelphia area. There is no indication, however, that the incidents are connected. The Community College of Philadelphia was last placed on lockdown after a student flashed a weapon during a dispute in a chemistry class.